Accurate media feeding ensures precise contour cutting over longer-length prints. Necessary media length is fed in advance to reduce tension during cutting. 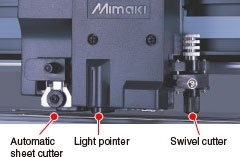 This functions increases the precision of long-length print media cutting.